Using a dedicated booking plugin can make it a lot easier to manage your salon, spa, or barber shop website. These plugins allow your customers to book their desired service and make the payment, while you will have detailed information about the booking and your clients. Since there are several saloon booking plugins available, you will find it a bit challenging to decide which plugin you should use. That is why I have created this in-depth post introducing you to the 7 best online salon booking system WordPress plugins. Salon Booking WordPress Plugin offers a complete solution for managing your salon booking system. The fully responsive front-end booking form makes it a lot simpler for the customers to choose their desired service and make the reservation. You can check out the booking status from the back-end booking calendar. The calendar supports different view periods including daily, weekly, and monthly. 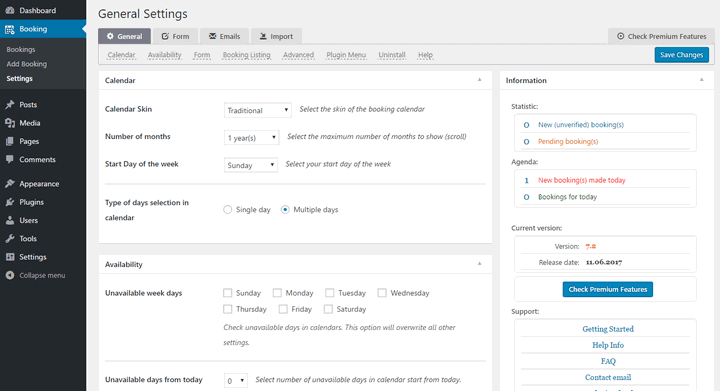 Use the advanced booking rules to set up the service availability times and holiday periods. Feel free to customize the booking form by choosing custom colors and providing your own text. Add the necessary services along with their price, duration, category, timetable rules, etc. The plugin allows you to add an unlimited number of assistants and define their schedule, holiday rules, and assign them to specific services. You can send both email and SMS notifications for various events like new reservation, assistant selection, reminder, follow-up, etc. There are different payment options for the customers. You can enable the online payment, pay later options. While the default payment methods are PayPal and Stripe, it is also possible to use other gateways by getting the add-ons. The in-depth reports will help you track the reservations, customers, earning, revenue, and so on. Thanks to the built-in sync option, admins can easily sync the reservations with their Google account. You can get the plugin for $45. This dedicated salon booking plugin could be an excellent choice for managing the services on hairdresser salon, spa, beauty salon, barber shop, and therapist websites. The plugin offers complete solutions to add the services you offer, add the assistants, and provide a booking form so that the customers can book services easily. Customers can choose the date, time, their desired services, and select their desired assistant during the booking process. You can configure the plugin settings from the Salon > Settings page of your dashboard. The settings page offers the available configuration options in different tabs. In the General tab, you can provide basic information about your salon, set up the SMS, email notifications, along with the date and time settings. The booking and payment options are available in the Booking Rules, Check out, and Payments tabs. You can enable different payment options including online payment, pay later, make a deposit, etc. The plugin supports two payment methods – PayPal and Stripe. The Style tab offers different options to customize the booking form. Go to Salon > Calendar to check out the booking calendar. You can view the daily, weekly, monthly, or yearly calendar. Feel free to manage the bookings, services, and assistants by going to the respective sub-menus. 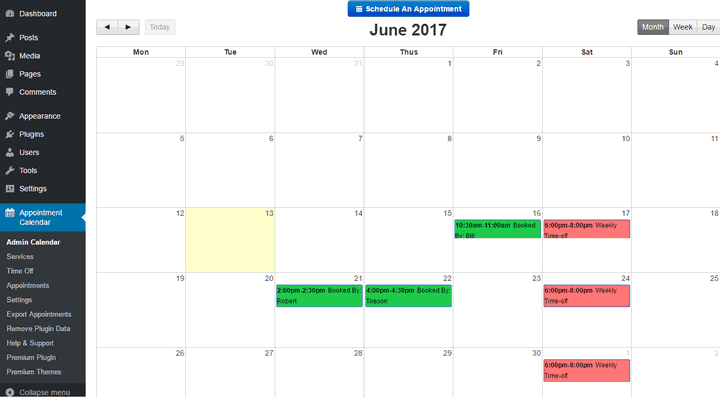 Appointments+ is a premium salon booking plugin from WPMU Dev. You can use the plugin to create an unlimited number of services and locations. Customers can choose their convenient time, desired service and make payment without leaving your website. You can add all of your employees along with a short bio and individual schedule. This makes it possible for the customers to choose their desired assistant. Your customers can complete the simple three-step booking process within a minute or two. They can make payment by using PayPal. 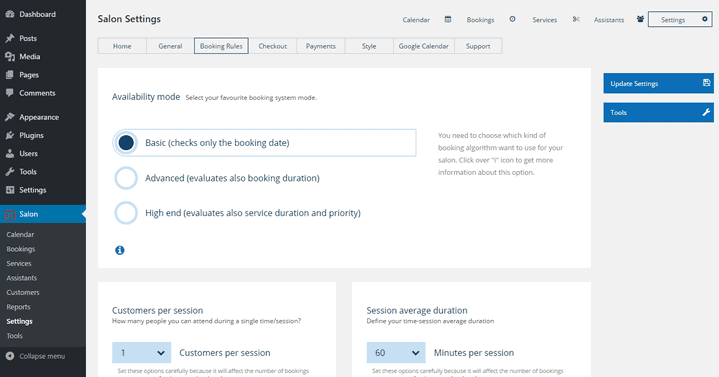 The plugin comes with several color schemes for the front-end booking form. It is also possible to choose your own colors and apply custom CSS. The integrated custom shortcodes and widgets make it a lot simpler to display the booking form and calendar on the sidebar, footer, or other locations. Administration permissions is a unique feature of the plugin that allows you to control which user roles can manage the booking settings. You can filter the appointments for a particular date range, export these, or sync with Google Calendar. Thanks to the built-in social login feature, you can enable the customers to log in with their existing social media accounts. You have to be a WPMU Dev member to use the Appointments+ plugin. Bookly Booking Plugin is another highly popular salon booking plugin that helps you automate the whole process. The touch-optimized booking system enables the customers to make the booking from any device. Thanks to the unique group bookings feature, they can book for several persons at once. Depending on your business, you can add an unlimited number of services and assistants, and group similar services into a category. The flexible schedule options enable you to set up various booking durations, padding time between the bookings, day-off, and individual working schedule for the employees. The plugin comes with a ready-made form, which will be useful for getting started quickly. It is also possible to use the built-in form builder to edit the form or create a new form. Bookly Booking supports all the popular payment gateways including PayPal, Stripe, 2Cehckout, Authroize.net, and PayU. The 50+ currency support and complete WPML integration will help you cater to your international customers. Use the SMS and email notifications to keep your customers updated about their booking. You can customize the text for various notifications like the new booking, confirmation, cancellation, upcoming booking, etc. You can get the plugin for $59. BirchPress Scheduler is a booking management plugin that can be an excellent choice for your salon website. The plugin offers a custom shortcode, which can be used to display a booking form in the footer, sidebar, or on a separate page. Your customers can use the form to check the availability of their desired service and make a booking online. While it is possible to get started with the default form, you can use the built-in form editor to create a customized booking form. BirchPress Scheduler is provided with several templates for the notification emails. You can customize the notifications emails for various events like booking, confirmed, canceled, reminder email, etc. The plugin comes with complete PayPal support for simple payment collection. Since it works perfectly with WooCommerce, you are free to use all the payment gateways supported by the e-commerce platform. As the plugin works perfectly with Google Calendar, Outlook, iOS, and Android devices, you can easily export or import the bookings and update your availability settings. The personal license of the plugin is priced at $75, which includes one year of support and updates. This flexible plugin enables you to add an online booking service to your salon, spa, beauty, or other relevant websites. Your customers can check out the availability of their desired service and make bookings within a few minutes. You can manage the plugin settings from the Booking > Settings page of your dashboard. The General section offers basic settings options like the calendar settings, availability options to define the calendar style and set up the regular working days. Booking Calendar comes with a ready-made booking form. You can customize the form in the Form section. Enable or disable various fields, customize the labels, mark these as required, or remove any field as you see fit. It is also possible to insert new fields into the form. The Emails section enables you to customize the email notifications for new booking, and various booking status like approved, pending, trash, and deleted. You can enable or disable each notification type, customize the sender name, email address, subject, and the actual email content. Go to Booking > Bookings to view a calendar of the bookings. You can choose between the monthly, quarterly, and yearly views for the calendar. There is a toggle button to display a list of the scheduled bookings. It is also possible to add a reservation manually by going to the Booking > Add Booking page. If you are looking for a free salon booking plugin that offers a simple user interface, Appointment Calendar will be one of the best choices for you. 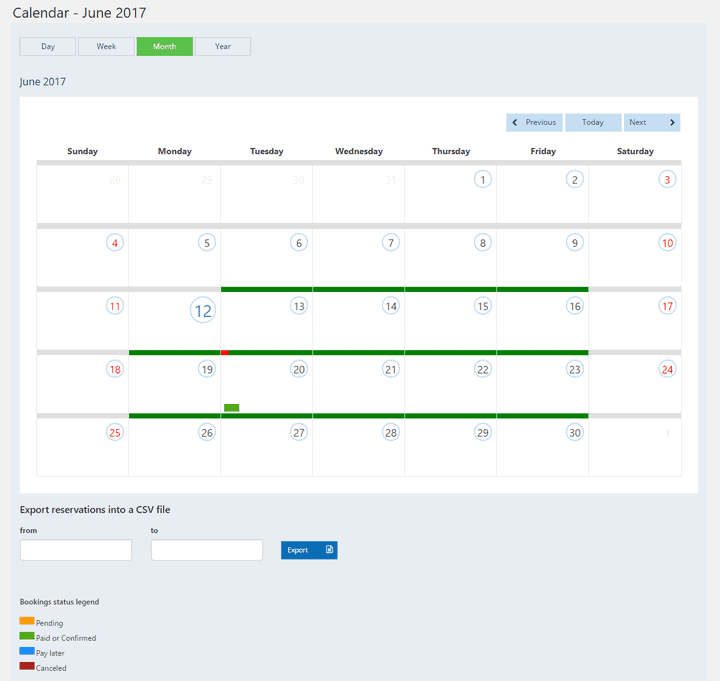 It allows the customers to check out the availability calendar and book their desired service by using the front-end booking form. You can add the available services from the Appointment Calendar > Services page. 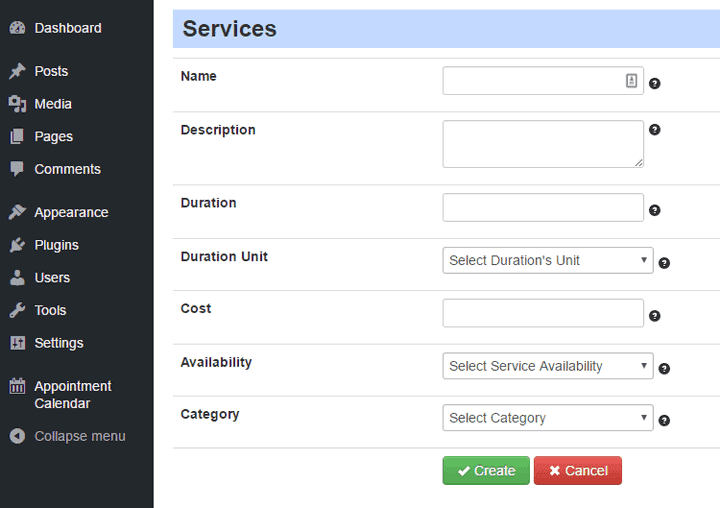 You can provide a name, description, and set up the duration, cost, availability, and category of the service. It is also possible to create categories and group similar categories together. The settings options are located at the Appointment Calendar > Settings page. You will find dedicated options to choose the day start and end times, the first day of the calendar, default calendar view, display the service cost, duration, etc. Appointment Calendar also allows you to send notification emails to both the admin(s) and the customers. You can customize the subject and body for various emails like the new booking, booking approved, and booking canceled notifications. Check out the calendar view of the current booking by going to Appointment Calendar > Admin Calendar. It is possible to view the calendar in daily, weekly, or monthly mode. You will find a list of all the booking in the Appointment Calendar > Appointments page. When it comes to managing your salon business, you should use a booking plugin. This plugin will take care of all the booking, payment, and customer management issues, while you can concentrate on improving the service. Go for Appointment Calendar if you are looking for a fast, simple solution. 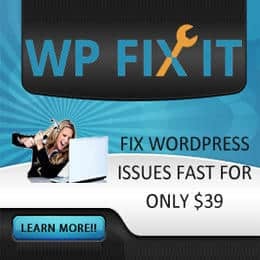 On the other hand, Salon Booking WordPress Plugin will provide you with all the advanced features you need. Great information in this article. Like the way you explain it. It is nice information about salon software, Thanks for sharing. Nice post mate. Looking forward to extending my business with one of these plugins.